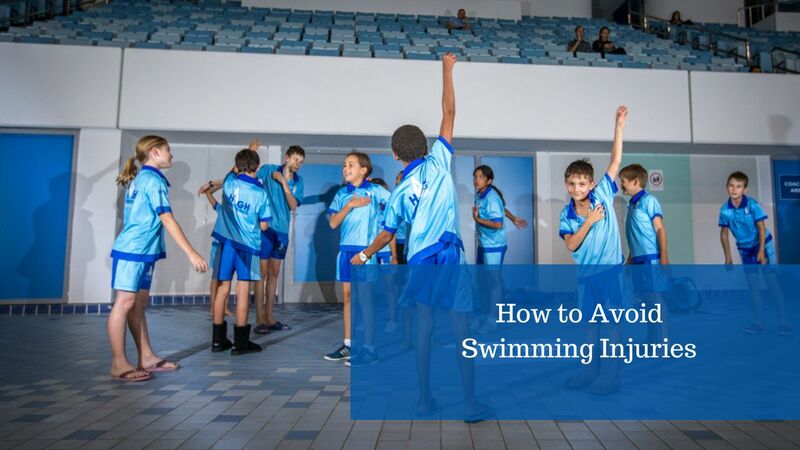 Most of us know swimming is a low-impact exercise and one of the least dangerous sporting activities however this doesn’t mean that injuries never happen. We’ll take you through some of the most common injuries and give you helpful tips on how to avoid them. Swimmers shoulder is an injury that affects the shoulder joint. It occurs as a result of the inflammation of the tendons that surround the rotator cuff. Swimmer’s shoulder can be from the wrong swimming technique. An example would be in freestyle stroke as the problem occurs when your hand enters thumbfirst, or it crosses the middle of your body when it extends to the front. Over stretching and over training can play a factor in a swimmer’s shoulder. With either over stretching and over training, your rotator cuff muscle tires faster than the muscles can recover and an injury results. To begin with, always make sure you are swimming with the right technique. Consider asking our swimming instructors to evaluate your strokes and point out mistakes. Also, avoid over training by making sure you have enough recovery time in between sessions?? Take breaks from swimming breaststroke. Properly warm up and perform stretching exercises prior to a swimming session. Perform strengthening exercises for the quadriceps and hamstrings. When swimming freestyle, keep your head in line with the spine, with your eyes looking straight down. You should not look to the front or lift your head forwardsto breathe. Likewise, avoid over-rotating your head during the inhale. When swimming the butterfly stroke or breast stroke, always keep your head aligned with the spine. Try to look down when inhaling, rather than to the front to ensure your head remains in a neutral position. In the backstroke, you should gradually increase your swimming distances to give your frontal neck muscles some time to adjust. Lower back injuries can be quite painful and are typically a result of incorrect technique. When swimming freestyle, you might be swimming with a high head position and your hips and legs sink. Consequently, you could be kicking intensely to keep your legs up and be overarching your back. In such a situation, you need to work on your position and balance in order to find a comfortable horizontal position. When swimming the butterfly stroke, poor technique could mean you’re lifting your upper body from the water with your back’s strength. In such a situation, you need to work on your style as well as a dolphin kick so that it is the body wave that lifts the upper body from the water and not the back. Also, stretch and warm up properly before trying butterfly stroke. Most injuries are from incorrect form and technique, and we might make the same mistakes that cause us these injuries over and over again without knowing it. We hope the tips we’ve included here help you avoid these injuries and remember you can always ask one of our friendly swimming instructors to check your technique if you’re worried.